Game one is in the books. It was a wild ride that ultimately ended in disappointment for the Nashville Predators as they fell three to two in regulation. The Dallas Stars weren’t going to roll over and hand the Predators the series, and it was evident after the first period. Nashville absolutely dominated the Stars for the entirety of the first 20 minutes. Pekka Rinne played well, but he was rarely tested. Meanwhile, the Predators were taking every shot they could and it looked as if Ben Bishop might not be able to handle everything. Make no mistake, this game was extremely even, as evidenced by the Predators and Stars creating 1.38 and 1.39 expected goals for at five on five, respectively. The back and forth was awesome, although both teams were flexing their defensive muscles for much of this bout. The Predators controlled quantity with 52.44% of shot attempts and 51.16% of shots on goal, but as they have all season, Dallas owned quality. The Predators only produced five high danger chances at five on five, with three coming in the first period. To be fair, they only surrendered six though. All stats below are at five on five unless explicitly stated otherwise. Special teams significantly limited five on five minutes, but we can see a few established trends. The JoFA line was unremarkable, plain and simple. Ryan Johansen had a couple of good defensive moments and Filip Forsberg was desperately trying to do something to put him back on highlight reels, but it never really came together. The trio had a great shot attempt differential, but never really penetrated the slot. For what feels like the first time this year, JoFA didn’t create a single high danger chance, but at least they didn’t give one up. If the Predators are going to win, they’ll need their first line to create more. The second line had a weird night, in my opinion. They got outshot, but did a good job of getting to the high danger area. Kyle Turris had the highest individual expected goals created of anyone on the team with .32 and the most high danger chances created with three. He had a great game and really worked on playing dangerous hockey, instead of low-calorie passing. Craig Smith and Mikael Granlund were fine, but they were a little too passive at times. Especially in the third period. I could see myself being talked into giving this trio a “B”, but I don’t think anyone will object to their current grade. Does anyone actually know if Nick Bonino was on the ice for this game? I see his stats and everything, but I really don’t remember seeing him on the ice. He might as well have not played, because his line got crushed. They gave up the most shot attempts, shots on goal, expected goals (by .6), and high danger chances. Maybe they had first game jitters? This line did a little too much of chasing hits and not enough establishing possession. The fourth line was fine, I guess. They didn’t see a ton of ice time in the third, and that’s probably for the best. There are some serious decisions to make before Game Two. Whether it’s personnel decisions (Grimaldi over Simmonds) or strategy decisions (exiting the defensive zone with possession), there is some clear work to be done. I don’t think I’ve seen a pairing who makes things look so easy in the offensive zone while making things look impossible in the defensive zone. Roman Josi and Ryan Ellis are an absolute force to reckoned with when the Predators have possession. Their passing in the offensive zone was crisp and on the tape while their shooting was finding holes in the traffic. No goals came from their point shots, but those efforts will be rewarded eventually. Josi’s goal was a thing of beauty, but it will most likely be forgotten due to P.K. Subban’s masterpiece. In the defensive zone, things were much different. They failed to exit the defensive zone more often than not while electing to dump the puck out ad surrender possession. The duo mostly faced second line competition but failed to produce any real high danger chances. Their deployment will be something to watch as the series goes on. It wasn’t pretty, but it worked. P.K. Subban and Mattias Ekholm locked down Alexander Radulov and Tyler Seguin for the majority of their minutes. It was ugly at times, but it worked. There was no shelter to speak of, but the dynamic duo stayed above water in terms of shot share and high danger chance creation. It’s a shame that their efforts aren’t rewarded with a win, but that’s hockey. Also, Subban’s goal was awesome and I’m excited to watch it again. The third pairing wasn’t bad, per say. They just weren’t that great. What the Predators need from their third pair is to not be giving up a ton of chances while giving their top four some much needed rest. I can safely say that Dante Fabbro and Dan Hamhuis did exactly that in Game One. I hope they aren’t replaced by Matt Irwin and Yannick Weber. 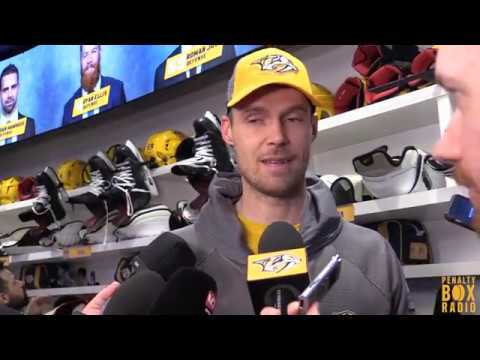 Pekka Rinne had a good Game One. It wasn’t spectacular, but then again, he didn’t have to be. The goal from Miro Heiskanen was a seeing eye shot and an absolute lazer. Those goals happen. The goal scored by Mats Zuccarello wasn’t Rinne’s fault. The goaltenders’ job is to get the first shot, it’s the defenses’ job to tie up the opposition. Rebound goals are tough, especially from that area. I think Rinne played well enough to win, his teammates didn’t provide enough scoring support.